A random printed part among the trials which permitted to progress in the development of the FoldaRap. The most interesting reward of this campaign, also probably the quickest way to have your kit! All you need to build the lastest version of the FoldaRap, excepted the printed parts. Find a local reprapper to add them to your kit ! All you need to build the lastest version of the FoldaRap ! We find a date that arrange everyone, and you came to build a FoldaRap with us in our super friendly Makerspace : the Nancy Bidouille Construction Club ! We find a date that arrange everyone to invite me (for a week-end to a full week), and I personally come with my machine to help you build and learn to use the FoldaRap(s) you may have funded ! A Laser cutter for the Makerspace ! 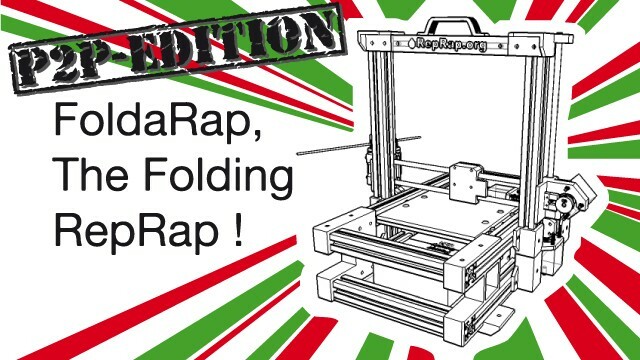 You may already know The FoldaRap (http://reprap.org/wiki/FoldaRap), an open-source 3d-Printer, easy to assemble, and most important : foldable to bring it everywhere ! After a first version and 30 prototypes I'm looking to make a second batch for the version 1.1. And to make it available for more people I need you to be a part of it. 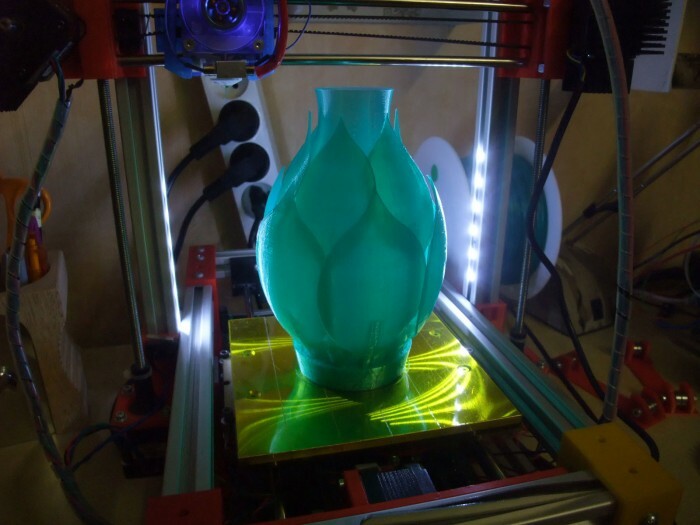 3D-Printer, RepRap, what's all about ? 3D-Printing is an additive manufacturing process : layers of plastic are successively laid down to produce objects relatively quickly. This allows to produce some pieces that would have been difficult to make with conventional processes (machining, injection), and contrary to molding there is no tooling. 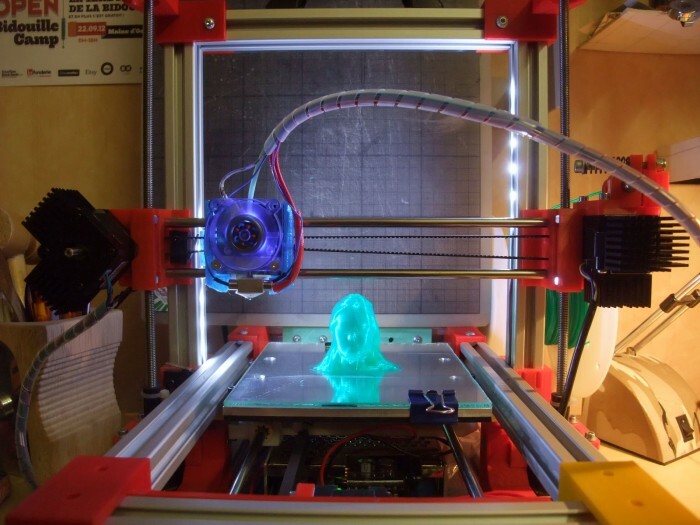 The technology of 3D-Printing is not new, but there have been a big change around 2006 : the team of the Dr. Adrian Bowyer (Bath University, UK) made the firsts RepRap (Replicating Rapid-prototyper) - a 3D-Printer which can prints some of it's own parts. However, the beauty of this invention resides not in itself but rather in choosing an open-source license (learn about it here http://reprap.org/wiki/Wealth_Without_Money ). 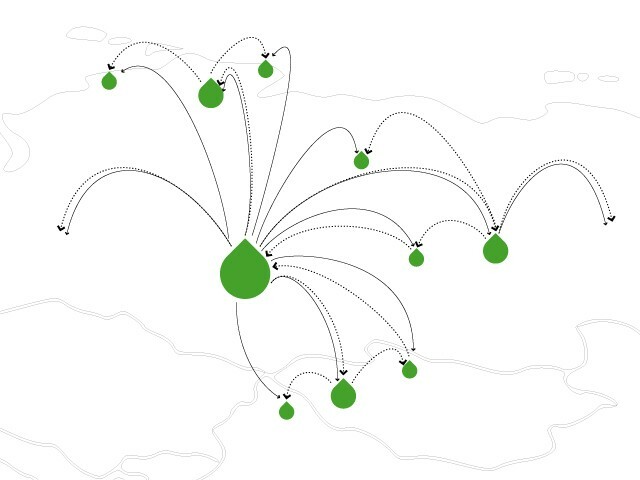 Quickly a vibrant community arose around this project, the propagation became exponential and variations started to flourish (see the RepRap Family Tree http://reprap.org/wiki/RepRap_Family_Tree). A technology which was only accessible to industry and big companies is now at hand of any enthusiast tinkerer. While 3D-printing makes it's way in schools, garages and homes, people start to make or try lot of things by themselves, useful or not, sometimes truly practical when it came to fix stuff or for custom-made parts. Looking at sharing platforms like Thingiverse, CubeHero, etc. reveals how creative everyone can be... what do you imagine then ? 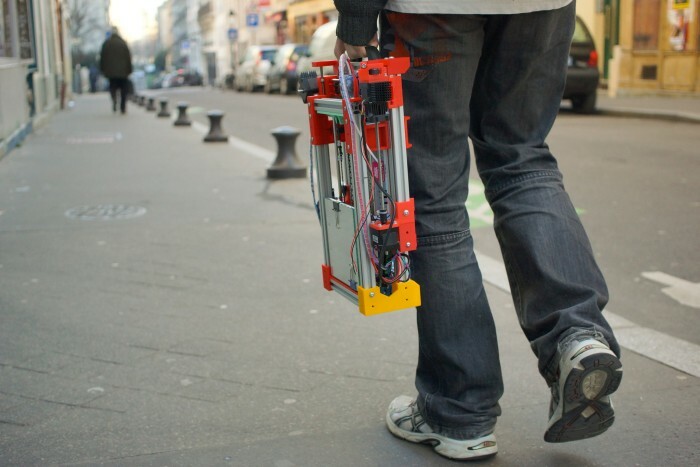 The idea of the FoldaRap came from the experience gained through different RepRaps and other machines that I built. 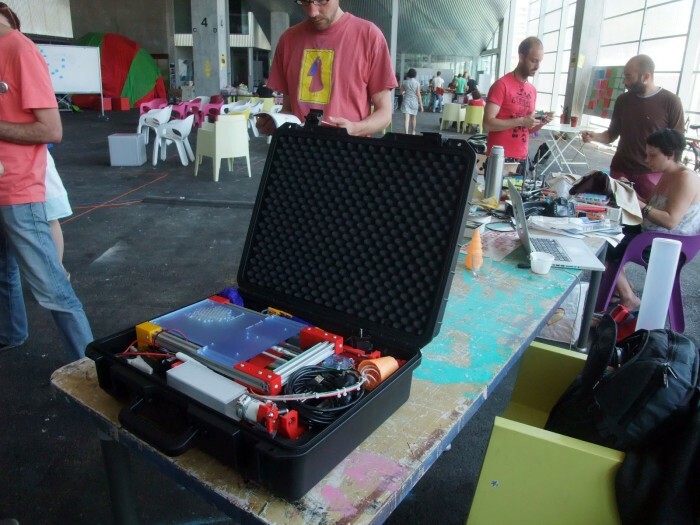 And mostly from several workshops and presentations that pushed me to develop a version that would be really transportable (in it's flightcase we could even take the plane with it, or just for storing under the desk when not used). Modular, this point is particularly important, not only to scale/tweak the machine, but also on a long term perspective, unlike machines based on custom cut panels you can reuse the basic construction elements in a newer version or other builds. It took me (only) several months to develop it. Fortunately I could build upon the shoulders of others. To perpetuate that virtuous circle I followed the known lesson in open-source software "release early, release often", I also included a detailed Bill Of Material and the project and its documentation are continuously refined over time. 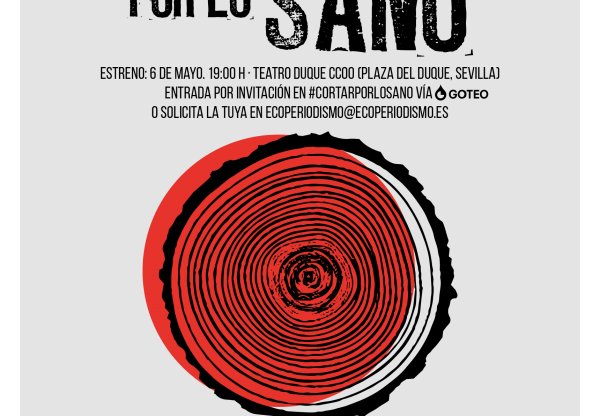 For who is this project ? I firstly aim this project for experienced users, already having a 3d-printer or aware of the personal manufacturing trend, the maker movement, FabLabs, etc. and the potential revolution they represent. Nonetheless, I designed the FoldaRap to be as easy as possible to build : you need few tools, and there is no distance to check during the assembly thanks to the push-fit strategy, making it easier to build than the previous models. "You don't own it if you can't open it", by building it yourself you will also got to know how it works in the details, which is useful in case you need to repair or adapt something on the machine (an appreciable difference over plug-n-play/closed machines). 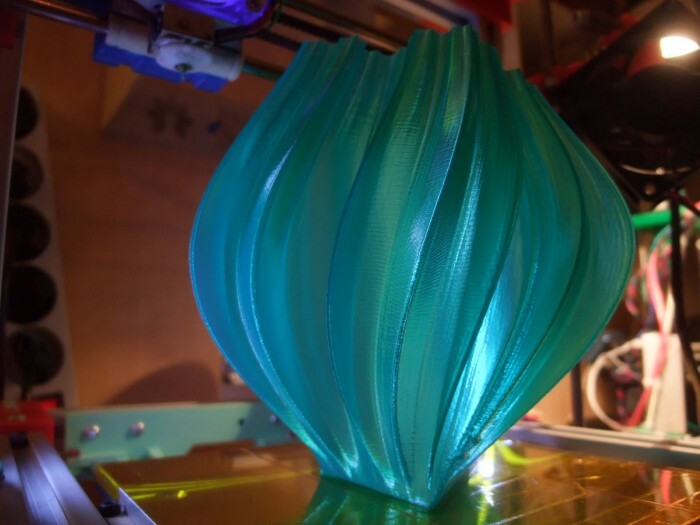 The FoldaRap will soon celebrate its first anniversary of printing (project start : 2011/11 - first printed object : 2012/05/24 ) ! And now this model has been replicated several times in the wild ! I take every project as an opportunity to try new things. The FoldaRap was the occasion to apply the nice lessons I learned from open-source in my design process, it was also my first and successful experiment of crowdfunding ! This time I want to go to a next level and experiment with distributed manufacturing and open-source business models. 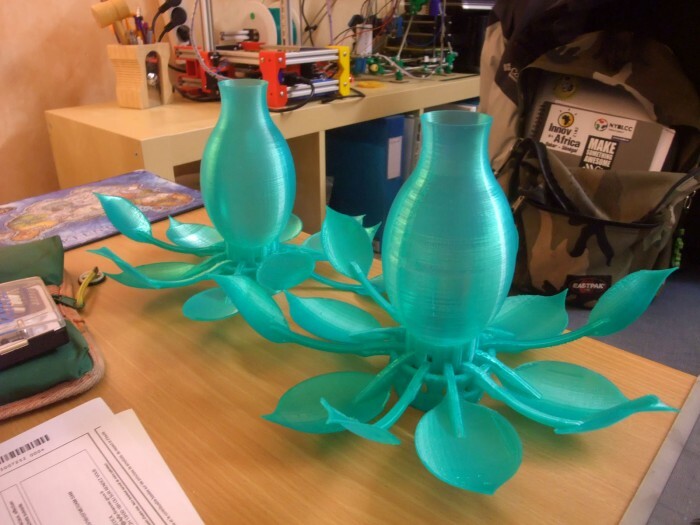 By offering mostly kit without printed part it will create a demand that the community can answer, sometimes locally (why ship printed parts when you can have them made near you? ), but I also asked for people who are interested by this experience to supply printed part for the complete kits, in this case we can think of it as a quality certification of the producers and their machines. Distributing the production over the community is also a way to scale up with agility, allowing me to supply a greater number of kits (which is good for bulk ordering) while sharing the profit with others. The next level experience is about a distributed low-cost 3d-printing service that I'm setting up with a team (http://3dprintskin.eu), because even if the machines are more accessible than before, there will be always people who just want their model printed, while those who are most interested by the RepRap could help them and make an additional revenue from it. When I was a child I wanted to be a tinkerer and change the world. Today I'm part of the Makers movement, and this enthusiastic generation who is building a better world, in order to progress each day toward the ideal of a more distributed and cooperative society. Instead of objects, I design environments/tools that allow individuals to create their own solutions. Thanks to this original approach I could met a lot of great people and contribute to the creation of several FabLabs/Makerspaces in France and Africa. I heard about it in 2009, somewhere on the Internet... One year later, after having read a lot of things and saved some money, I started to build a Mendel (the second RepRap generation at this time), but it was way harder than today : it took me 6 months to finish the machine and print my first object. Later I had the occasion to build many more machines, Prusa, Orca, Huxley,etc. (spending hundreds euros in that hobby). Following a discussion with a friend I started to map the complete RepRap genealogy, by curiosity and to show the power of the community : the RepRap Family Tree (with more than 400 we are now trying to automate its generation while it is still made by hand for the moment). I choose to limit the first batch of FoldaRap to 30 machines (www.ulule.com/foldarap/), to lower the risks and cope up with the demand by myself. 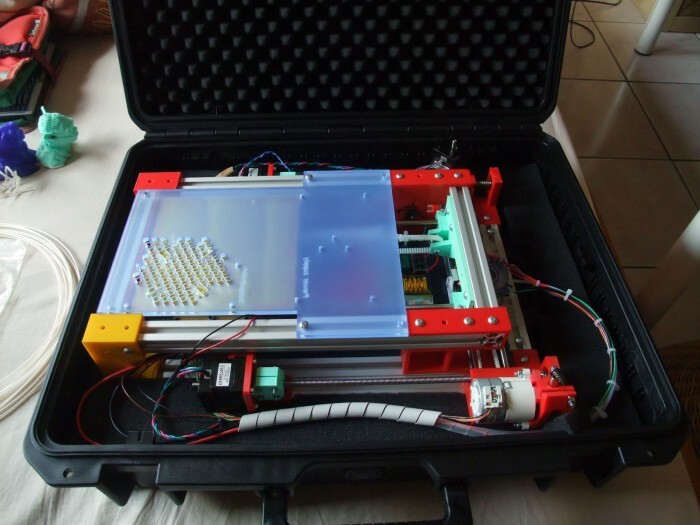 After that experience, with the strategy of p2p manufacturing and the team at 3DPrintSkin, I'm now confident to go a little further, and I'm aiming for 50-100 kits (for which I already have most of the materials as you can follow here http://reprap.org/wiki/FoldaRap_Batch2 ), but to make it real I need you : support us, spread this campaign, join the movement ! 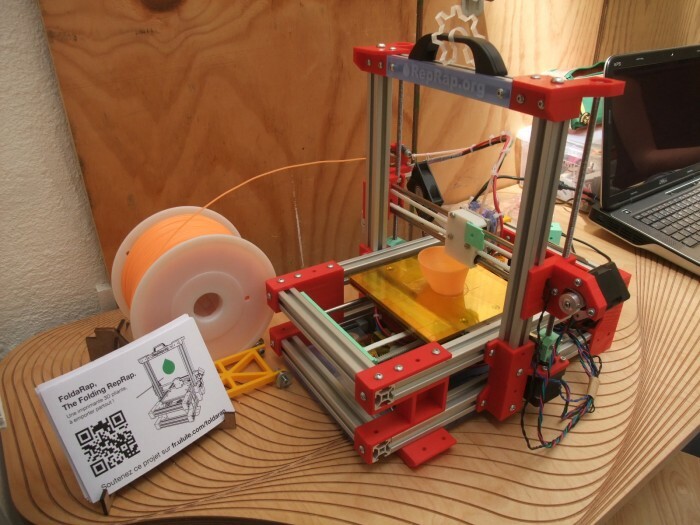 Beyond the FoldaRap, this campaign is also a way to support other futur projects, that will benefit the commons, like the RepRap Mondrian, the micro-fablab-mobile, or even to have quality PLA filament manufactured in France (while most of the products we buy today are imported).